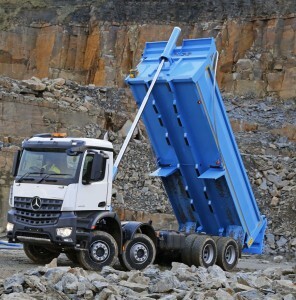 Construction, infrastructure and design company Morgan Sindall are the first UK company to receive the new Mercedes-Benz Arocs truck, the cleanest commercial vehicle in production. The £100,000 Euro VI vehicle uses a combination of advanced engine technologies to drastically reduce emissions, and Morgan Sindall have leased two. They will be working on the organisation’s contract to re-lay the runway at Heathrow Airport, delivering materials to the site and clearing the work areas. Jonathan Hall, Plant Director for Morgan Sindall, said: “As a major UK construction and infrastructure company, we take leader role in driving forward our industry’s sustainability performance. “We believe that working this way is fundamental to the reputation and continuity of our industry. James Colbourne, Head of Strategic Accounts at Mercedes-Benz Truck Sales and Marketing, added: “Working with Morgan Sindall and their vehicle supplier Paul Bumford at Leeds Commercial Vehicle Hire, has been an extremely positive experience. “As one of the UK’s leading construction and infrastructure companies, Morgan Sindall requires vehicles that are green, safe, economical and robust and the new Arocs delivers all of this and more.